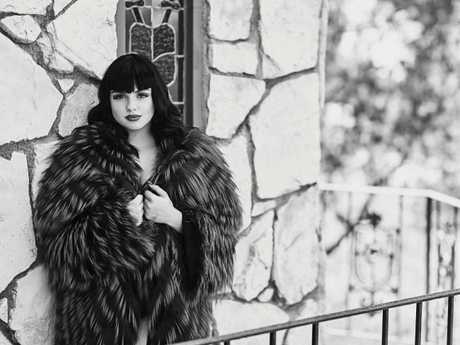 ARIEL Winter has undergone a dramatic makeover for her appearance on the cover of the latest issue of LaPalme magazine. The Modern Family star, 19, channelled Golden Age-style glamour with her blunt fringe hairstyle, and was wearing a fitted dark red gown with a plunging neckline and embellished sleeves. She appeared in several other pictures throughout the magazine, looking incredibly glamorous. In one photo, Winter posed with her hands on her hips, wearing oversized white sunglasses with an elaborate full-length lace dress. The actress wore an oversized fur coat and a dark lipstick while striking a sultry pose on a balcony for a black-and-white picture. It was a far cry from her usual look - which has repeatedly been targeted by critics. Just last month, Winter delivered a lenthy Instagram rant after being trolled for her outfit choices. She wrote: "Something I wish people would realise ... I am not TRYING to be featured on Snapchat, I am not trying to be pap'd everywhere I do, I am literally just LIVING and unfortunately, I can't do that without paparazzi following me around everyday. "I'm not trying to show you my a** in shorts when I go to the grocery store. I'm trying to live my life. People wear shorts. People have wardrobe malfunctions. No one is perfect." "I'm not a stylist! I don't know what to wear everyday so I look 'appropriate' or 'fashionable.' Also, screw having to always look appropriate or fashionable. For what? Society? Who gets to decide what is appropriate or fashionable???? I wear what I like and no one should fault me for that."